This graph illustrates the relationship of these plans. As you enter the workforce, the most important asset you have is your ability to earn money. Income Replacement Insurance provides a temporary source of income if you are unable to work due to accident or sickness. If your situation prevents you from going back to work, coverage may continue to age 65. These types of plans have a waiting period before you receive payment. They may be employer sponsored group benefit plans or they may be individually owned plans. Benefits are typically a tax free portion of your pre-claim income and has a definition that sets the length of time the payments will continue. There are many variations of coverage available and you should consult a professional advisor. Critical Illness Plans provide a lump of cash in the event that you are afflicted by one of several common illnesses. The most common problems are created by cancer, heart attack or stroke. Plans vary and may include a list of over 20 illnesses. This type of plan solves the problems of providing money to seek alternative opinions, the costs for family members in time lost from work and travel costs when the patient must go out of town and accommodation. Some illnesses can create significant costs to the family over time. These additional costs will impact your ability to save for retirement. Many of these plans can be converted to Long Term Care Plans (LTC) -see below. Life Insurance provides protection of your loved ones. Life Insurance delivers cash at death for the purpose of providing a source of income for your remaining family members. it may also be used to pay outstanding debts and create reserves for such things as education. Term insurance is frequently used to provide "temporary" protection to families and business owners in the event of a death. 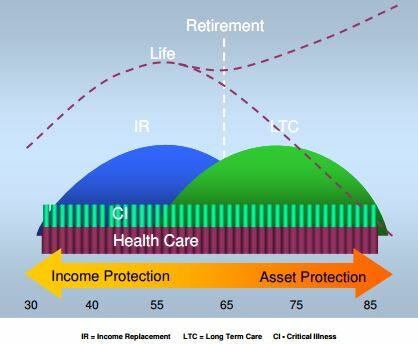 Permanent insurance should be the basic component in your plan, to assist with asset protection as you age. Permanent Insurance may be used in Estate Planning strategies.